After days of a political slugfest in Karnataka, JDS leader HD Kumaraswamy is all set take oath as state’s new Chief Minister. The sworn-in ceremony will take place at 4:30pm on Wednesday at Vidhan Soudha in Bengaluru. According to a government press release, Governor Vajubhai Vala will administer the oath of office and secrecy to Kumaraswamy. Earlier, the swearing-in ceremony was scheduled to be held on Monday, but was postponed as it coincided with former Prime Minister Rajiv Gandhi’s death anniversary. Except this, Dalit leader and state Congress president G Parameshwara will be sworn in as the Deputy CM. Congress leader K R Ramesh will take oath as Speaker of the Karnataka Assembly. Reports said that eminent politicians, including United Progressive Alliance (UPA) chairperson Sonia Gandhi, Congress President Rahul Gandhi, Bahujan Samaj Party chief Mayawati, West Bengal chief minister Mamata Banerjee, Andhra Pradesh chief minister N Chandrababu Naidu, Delhi Chief Minister Arvind Kejriwal, Kerala Chief Minister Pinarayi Vijay, former Uttar Pradesh chief minister and Samajwadi Party chief Akhilesh Yadav, Rashtriya Janata Dal leader Tejaswi Yadav, Telangana Chief Minister K Chandrashekhar Rao, Dravida Munnetra Kazhagam (DMK) chief M K Stalin are likely to attend the ceremony. 04:45 pm | Opposition leaders, including Congress’ Sonia Gandhi & Rahul Gandhi, SP’s Akhilesh Yadav, AP CM Chandrababu Naidu, WB CM Mamata Banerjee, RJD’s Tejashwi Yadav, CPI(M)’s Sitaram Yechury, NCP’s Sharad Pawar, & newly sworn in Karnataka CM HD Kumaraswamy at Vidhana Soudha. 04:40 pm | In the presence of many prominent leaders from across the country, Janata Dal Secular state president HD Kumaraswamy took oath as the Chief Minister of Karnataka administered by Governor Vajubhai Vala. After his oath, Congress’ G Parameshwara took oath as the Deputy Chief Minister of the state. 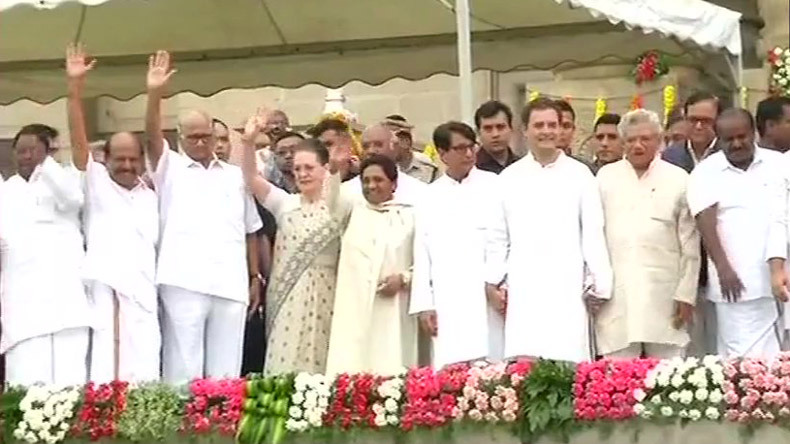 04:30 pm | It has become a star-studded affair of a political kind in Karnataka where Congress president Rahul Gandhi, Sonia Gandhi, Bahujan Samaj Party’s Mayawati, Samajwadi Party’s Akhilesh Yadav, CPM’s Sitaram Yechury, JDS’ HD Devegowda. 02:13 pm | “No one is unhappy, we all are together. We are celebrating that our government is coming in power. I never said that I’m an aspirant of Karnataka Chief Minister post. All is well,” said Congress’ DK Shivakumar. 12:40 pm: Following the swearing-in ceremony of JDS-Congress coalition government, ‘Anti-People’s Mandate Day’ has been observed by the BJP. “Hunger, greed & power is the basis of JD(S)-Congress alliance, such alliance will not even last 3 months,” BJP state president Yeddyurappa was quoted as saying. 11:11 am: “All the promises made in the manifesto will be implemented. Safeguarding the interest of the farming community is our top priority,” Karnataka CM designate HD Kumaraswamy was quoted as saying. 10:08 am: On being asked that Roshan Baig & DK Shivakumar were also in the race for Dy CM Karnataka, G Parameshwara,Dy CM designate said that it is the high command which decides all these, they chose me. I thank them immensely but the point is they’re also eligible but they gave me this opportunity.